exactly. The moment I open NDTV, i am sure to see some picture or the other pertaining to this family's celebrations. huh...not sure why i thought they were already married. Mick Jagger's current partner is relatively short at 5'6" or so. But here whats in news is the age gap. She is/was in lates 20s and he is in 70s. And his latest son is younger than his great grandson. Even Charlie Chaplin married his last wife (?4th?) at the age of 54, while she was 18. They sired 7 kids !! Were his wives taller than him ? Would be difficult to get accurate heights after 100 years, but let me check. BTW, my nanaji was a successful lawyer. Looks like my naniji was an inch taller than him. they married when they were kids. So she outgrew him. They both passed away well before I was born. One of the world's richest if not, the richest guy leaves the world's richest ex wife. 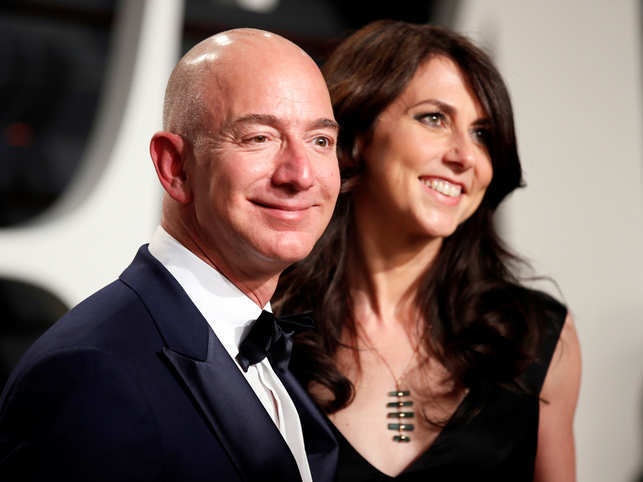 googled and found that Jeff Bezos is 5'7" whereas his (already ex?) wife is 5'10"
Rich in heart , mast punch line hai. Not allowed to be in Social media, hence discontinued, there was episode of GpCaptn Arun Marwah. So deactivated FB too. On leave and in Delhi with grand old man, so temporarily available. She might have become richest woman after divorce. I think women have it easy once they marry a rich person. Bhai, I think Marwah's fall was not social media. Honey traps happen even without social media. having said that I am not active on Social Media either... I have logins to most social media but probably login once a year. Yes, even I thought the same, but an order is an order.